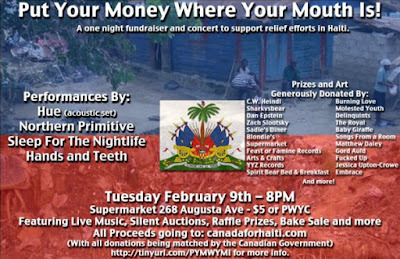 So tuesday there is a benefit for haiti victims at the supermarket in kensington. Lots of great stuff happening. Im not too involved in it but I've donated some art and its for a good cause. in fact. this is probably the only socially constructive thing I've done with my art ever. well hooray for that, I cant even imagine the horrifying things that are going on down there. soooo...lets party?